At their respective events, Karisma and Malaika were seen wearing strapless Amit Aggarwal gowns with metallic accents. Care for either or neither. My vote went to Karisma. Much preferred the color combo and the fit. The gold skirt of Malaika’s gown didn’t seem to fall right. 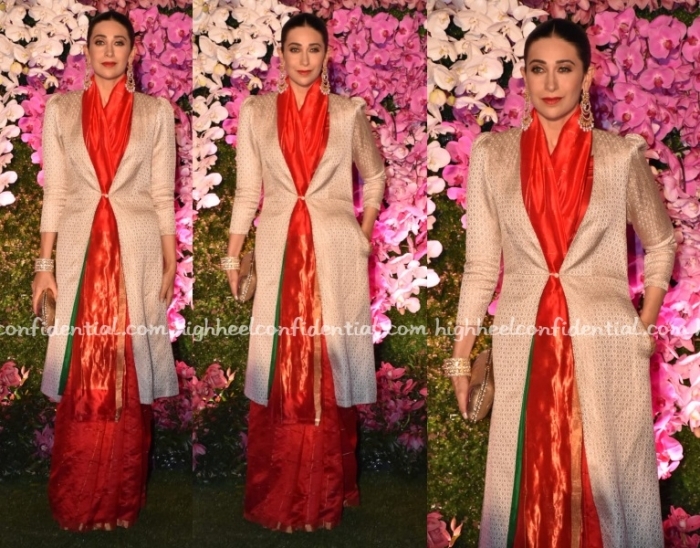 Karisma opted for a sari again, this time wearing a Raw Mango sari and a long jacket, also from the label. I feel like kundan round studs would’ve worked better with the combo but she looked lovely nevertheless. It was a Good Earth Couture sari for Karisma while at a wedding earlier today. The color palette and the styling is just as we’ve come to expect from her… No, it’s not a bad thing. She looked elegant. For a recent round of travel, Karisma teamed her denims with a Bella Freud jumper. Her accessories included her trusty Hermes tote and knee-high boots. She looked well put together, as is usually the case. P.S: Shop the jumper here. We recently had two sightings of Ms. Kapoor at the Mumbai airport. As she was making her way in to the airport, she was photographed in a dress and jacket by Integument. Balenciaga bag and pair of ankle boots were among her accessories of choice. Back in town, as she was exiting the airport, Karisma was photographed in denims and a ‘Live Local’ sweatshirt from Sundry. She teamed the separates with same black accessories. Karisma wore both of her looks well.